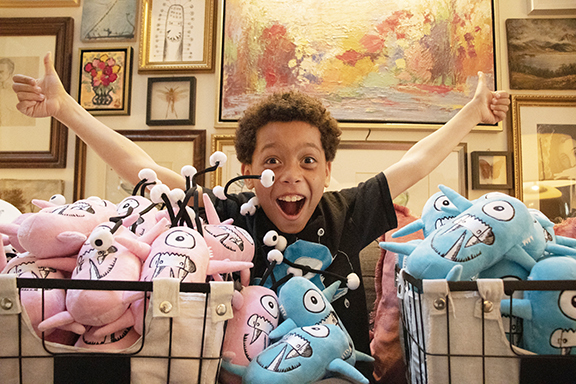 Ben Howard, from St. Joseph Catholic School in Leslieville, with some of his "monsters" from The Monster Project. Photo by Kevin Vitorino. As he grabs his pencil and paper, he begins to draw an odd oval shape. Taking his time to make sure that he has created the perfect outline, he then continues to add eyes, feet, and ears, explaining how one is unlike the other. To complete the drawing, he adds details including shading and finishes off with either ink, watercolour, or charcoal. The more detail, the better the drawing will look, he explains. Nine-year-old Ben Howard is a student at St. Joseph Catholic Elementary School in Leslieville. Instead of hiding from monsters, this Grade 4 student is creating his own for a good cause. Ben is the founder of The Monster Project, a charity-driven initiative in which a portion of proceeds go to The Angel Foundation for Learning (AFL). AFL is the official charity of the Toronto Catholic District School Board which facilitates the nutrition programs for all of the schools. The charity works to ensure that no child is left behind and that the playing field is level for all children. The money that the charity raises goes directly back to Toronto schools to assist students and families in need. “I think that we’re there to raise our kids to make sure they have a voice, and to be able to share that voice with something. If they can make a change, they can. And he’s already made a change because he’s brought more awareness to The Angel Foundation already,” said Stephan Howard, Bens father. Ben has been drawing these friendly monsters for a couple of years now. The young artist said he draws inspiration from his imagination and his dad. The initiative started by simply giving his art as gifts or keeping them for his family. However, Ben wanted to make a difference and with the help of his family and friends he was able to start this project. Howard who is also the Partnerships, Fundraising & Special Events Manager at AFL, is extremely proud to see his children using their talents to do good. “He’s taken a lot of initiative as a nine-year-old and its really kind of awesome to see… As a parent, you couldn’t ask for anything more than your kids to be able to do stuff like that. And I’m super proud,” said Howard. In the future Ben hopes to continue to expand The Monster Project and have other kids help him in growing the initiative and creating a brand. He also wants to work with more charities to inspire more kids. The Monster Project will be taking part in the Toronto Art Crawl Spring Pop Up this Sunday, April 7. The show exhibits emerging artists and artisans from across the country. According to the Toronto Art Crawl’s Twitter, Ben is the youngest artist to participate in the show to date. “I’m looking forward to sharing everything I do. And I’m looking forward to people being happy about my monsters,” said Ben, when asked why he’s excited to participate in the Toronto Art Crawl. The Monster Project will be selling everything from plush toys, original art, notecards, limited edition prints, t-shirts, and baseball hats, at the Toronto Art Crawl with a portion of proceeds going to the AFL.